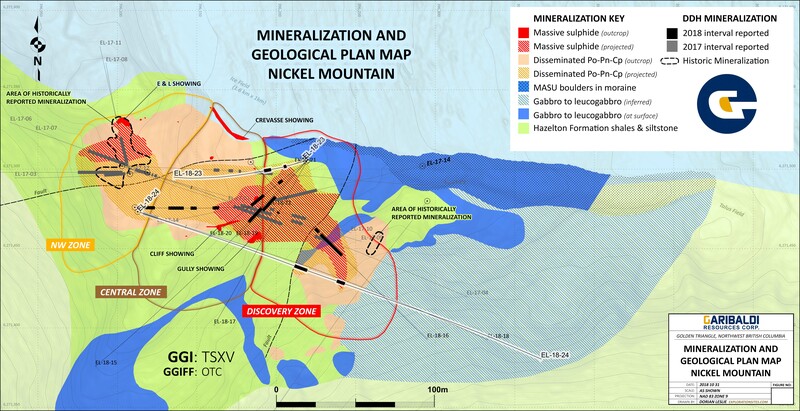 VANCOUVER, Oct. 31, 2018 /PRNewswire/ - Garibaldi Resources (TSX.V: GGI) (the "Company" or "Garibaldi") is pleased to announce that assay results for an additional two drill holes at Nickel Mountain have expanded the Discovery Zone to the northwest and southeast. The EL-18-24 and EL-18-23 nickel-copper-rich massive sulphide intersections, like others at Nickel Mountain, are significant not only for their grades and widths but such intercepts represent highly prospective new target areas along the "magma highway" to vector into additional massive and disseminated sulphide mineralization. The Golden Triangle's first magmatic Nickel sulphide system, featuring the Discovery, Central and Northwest Zones, remains open in all directions and drilling continues as Garibaldi crews push further into the fall season than last year. Dr. Peter Lightfoot, Technical Advisor for Garibaldi, commented: "When compared to magmatic nickel sulphide deposits around the world, massive sulphides at Nickel Mountain have unusually high grades of nickel, copper, cobalt and precious metals. "The Discovery Zone massive sulphides in the footwall at E&L form a continuous wide sheet of mineralization that appears, despite structural modification, to have been injected as a significant pulse of primary magmatic sulphide," Dr. Lightfoot concluded.